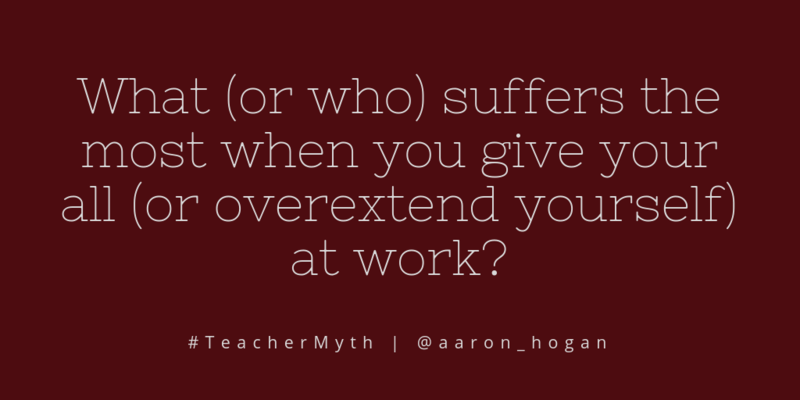 What (or who) suffers the most when you give your all (or overextend yourself) at work? There is nothing easy about answering this question for me. My family and my health take the biggest hit when I overextend myself at work. My kids notice that I get home later. I can tell when I am distracted and not really with them when I’m there. I miss opportunities that I simply should not miss. And, unfortunately, I do not think I am alone in this. The teacher who excels at meeting minimum expectations does not have these problems. The teacher who makes no attempt to create relational connections with students does not have these problems. The teacher who cares–especially the teacher who cares deeply–is the most susceptible to this. As odd as it seems, the educators who are going above and beyond to grow themselves are the most likely to end up on the wrong side of this. The ones who are connecting. The ones who are blogging. The ones who seek out conversation for professional growth. You’re the ones who are at risk for this. The teachers in movies and tv shows are not. As long as we are invested in getting the most out of our students and asking the most of ourselves, there are no magical cure alls for this, but there are some questions we can ask to help keep us on the right track. Have you settled into a pace that you can maintain throughout the year? What’s working well for you at your current pace? What are you giving up to run at your current pace? What do you have control over that contributes to your current pace? Are you comfortable with that give and take in this season? How does your pace impact your commitments outside of school? How does your pace impact your ability to invest in yourself? What does an ideal pace look like? How does your ideal pace change during different seasons of the year? Where is one small place you can start? But with some careful thought invested in this process, I hope to begin to see where I can make the changes that fit best for me and my family. Is everything up to a simple choice for me? No. Much is outside my control. I imagine the same is true for you. Still, I don’t want to miss a chance to tinker with the portions I have control over to make sure I’m finding the best fit for me and my family each season throughout the school year. I don’t want you to miss that chance either. The work we do is important. Though there will be seasons where we will give more of ourselves, we cannot operate out of exhaustion for extended periods of time without consequences. The work we do to invest in ourselves absolutely benefits the students and teachers we serve. 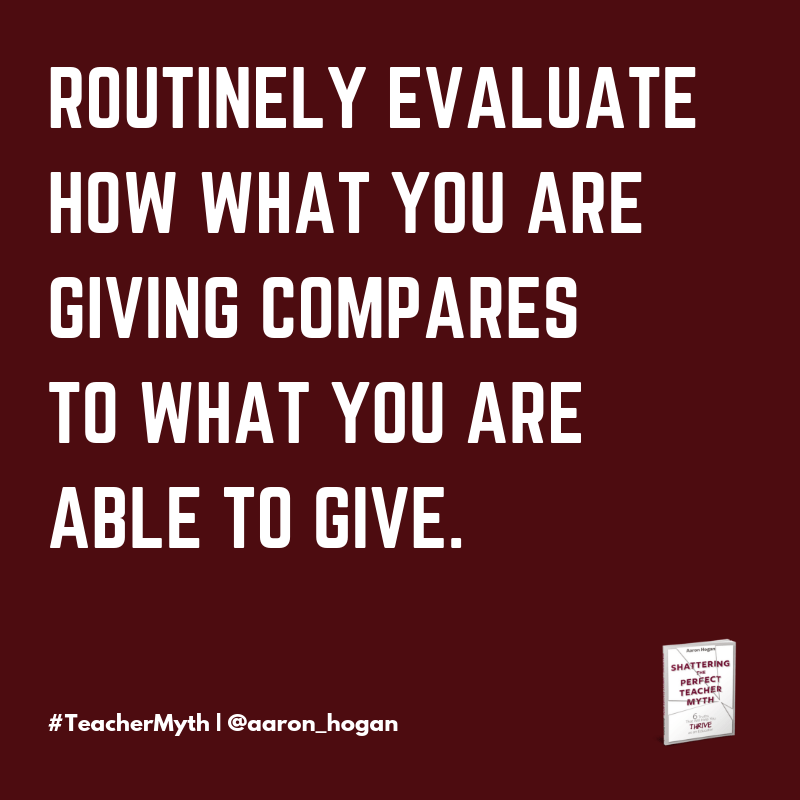 We need to routinely evaluate how what we are giving compares to what we are able to give. With the time we can impact, do everything you can to find the right fit for the right season. It’s ok to fe tired. It’s ok to be exhausted. But neither of those have to leave you defeated. A pace can be changed. Maybe not as fast as you’d like. Maybe not in all the ways you’d like. But paces can change. Don’t make the mistake of letting the year go by without thinking through the pace you are setting for yourself. Thanks for sharing your thoughts on this. I too often find that my pace is not ideal. I have just returned from yet another weekend away from my family to learn more about how I can be better at doing my job; but as i do this again and again, I realize that maybe what I really need to do it just stay home. I haven’t found the perfect balance and to be honest the added learning helps to make me feel more relaxed. I do know I need to do a better job of setting my pace – this is a great reminder and I will be thinking about your questions for the next little while. They may even end up as a blog…if I can find the time. Have been feeling this way for a few weeks and then feeling guilty when I take a few moments for myself or to be with family. I needed to read this today. Thank you!